In Washington State, title to real property can be transferred from one party to another using a warranty deed. 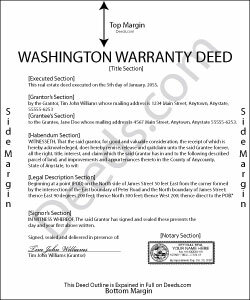 When recorded, a warranty deed conveys an interest in real property to the named grantee with full warranties of title. A warranty deed contains the phrase "conveys and warrants" and offers the most assurance of title. It conveys real property in fee simple to the grantee and contains implied covenants by the grantor that he or she holds title to the property and has "good right and full power to convey the same"; that the property is "free from all encumbrances"; and that he warrants "the quiet and peaceable possession" of the property and "will defend the title thereto against all persons who may lawfully claim the same" (RCW 64-04-030).This assurance offers greater protection to the grantee than a special warranty deed, which guarantees the title only against claims that arose during the time the grantor held title to the property, or a quitclaim deed, which offers no warranties of title. In addition to meeting all state and local standards for recorded documents, a lawful warranty deed includes the grantor's full name, mailing address, and marital status, the consideration given for the transfer, and the grantee's full name, marital status, vesting, and mailing address. Vesting describes how the grantee holds title to the property. Generally, real property is owned in either sole ownership or in co-ownership. For Washington residential property, the primary methods for holding title are tenancy in common, joint tenancy, and community property. A conveyance of real estate to two or more persons creates a tenancy in common, unless a joint tenancy is declared (RCW 64-28-010). A conveyance to a married couple is presumed to be community property, unless declared otherwise (RCW 64-28-020, 64-28-040). As with any conveyance of realty, a warranty deed requires a complete legal description of the parcel. In Washington, an abbreviated legal description of the property must appear on the first page of the instrument. If the full legal description appears elsewhere in the deed, its located should be indicated on the first page (RCW 65-04-045). In Washington, real estate excise tax is levied based on the amount of consideration. If the transfer is exempt from the excise tax, denote the reason for the exemption on the face of the deed. Find a list of exempt transfers at RCW 458-61A-200 through 217. Recite the prior deed reference to maintain a clear chain of title, and detail any restrictions associated with the property. The finished copy of the deed must be signed by the grantor (and his or her spouse, if applicable) and notarized. Record the original completed deed, along with any additional materials, at the recorder or auditor's office of the county where the property is located. Contact the same office to verify recording fees and accepted forms of payment. This article is provided for informational purposes only and is not a substitute for the advice of an attorney. Contact a Washington lawyer with any questions related to the transfer of real property. Will C. said: I was very happy with my interaction. The county didn't supply the book and page which was what I needed. The tech refunded my money since I didn't get the info I needed. I will use Deeds.com again. Mark E. said: Thank you for your Swift response. Have docs I was looking for! Victoria L. said: This is a fantastic website and financial savings to many. Being able to download and complete the document I needed vs having my attorney complete saved me $800. I would highly recommend this website. Reply from Staff: Thank you for the kind words Victoria. Have a great day!